At Just Tyres Newbury you can have your tyres fitted or delivered, and we have quality brands available for all kinds of cars and vans. We pride ourselves on delivering the best possible service in the industry and our four promises ensure our team is well equipped to exceed our customers' expectations. Our Newbury tyre fitting centre can be found on Hambridge Road, Berks, where appointments can be made for free tyre checks, while we're always on hand to offer advice on choosing the right tyre for your individual tastes and requirements. Buying products from our website is easy and you can have your tyres in Newbury delivered to your door or fitted by our professional team. Finding tyres suitable for your vehicle only takes a few seconds, and all you have to do is specify your tyre's details using the homepage search tool. You can then browse our selection, make your order and proceed to checkout. We have a wide range of tyres in Newbury, including the 4x4 range, cold weather range and van range. 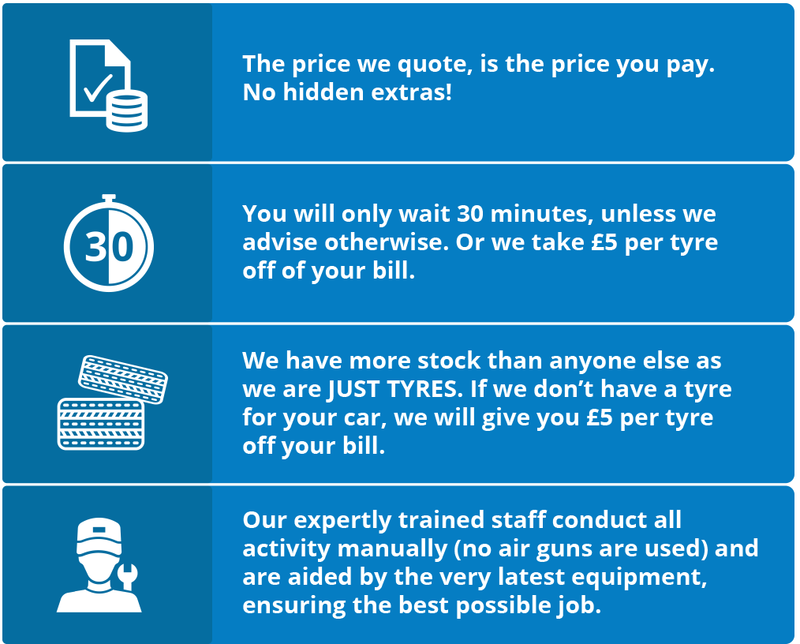 Each and every tyre purchased on our website comes with a 5 year manufacturer's warranty, while our customers are guaranteed secure online payments and a fast and efficient service. To acquire an accurate quotation from Just Tyres, simply fill out our form, we will then get in touch with you via email or by telephone. You can be kept up to date with our latest discounts by registering your details, while appointments for advice or tyre checks can be made online too. To find out more about our latest products and services call us today on 0845 456 9903 or send us over an email. You can also request a call-back or use our online chat service.